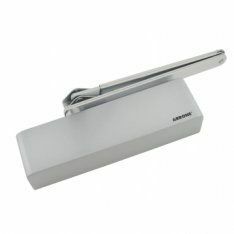 Medium Duty Door Closers are largely designed for medium doors of up to 1,100mm in width and 80kg in weight. A medium duty door closer is essential for fire safety best practice, internal access, and to prevent heat lose and cold drafts. At Ironmongery Experts, we stock a wide range of medium overhead door closers, available in a range of materials including; polished brass, stainless steel, polished chrome and gold enamel. Our range of medium duty door closers include an adjustable valve, which allows for the adjusting of the mechanisms closing speed, latch action, delayed closing and back check for preventing the door from slamming open. Our range of medium duty door closers adhere to fire regulations, ensuring the door is fully closed and preventing the circulation of fire and smoke between rooms. Due to the adjustable valve, one can alter the speed of which the doors can close, allowing for easier movement between rooms. If you have any questions on medium sized duty door closers or any other products in our range, please don’t hesitate to contact our friendly and knowledge sales team at Ironmongery Experts.